Iris can be seen growing in early spring and throughout the summer months. Its appearance can be very different from one another with various heights, characteristics and blossom/leaf colour. There are two kinds of iris that can flourish in this area. 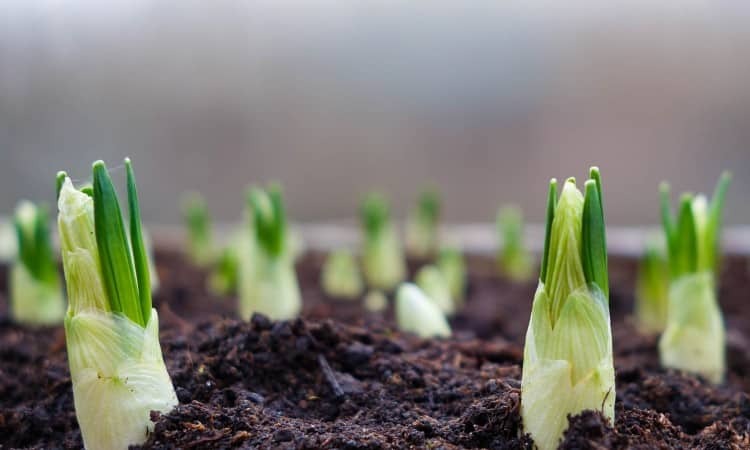 Some are formed by bulbs planted deeply in the soil, others growing from rhizomes, which are horizontally half buried. Distinct characteristics also differentiate this family of plants. Blossoms can be one colour or more, have plain or ruffled edges and be heavily veined or not. Petals can fall deeply towards the ground or be more upright, leaves can be various shades of green or variegated with white or yellow, and blooms can be bearded or not. A “beard” is a term used to describe the marking inside the center of each petal. If an iris is bearded, then the central stripe usually another colour (but not always), and reaches halfway down the length of the petal has fuzzy hairs growing on it. If a plant is referred to as “beardless”, then this marking is without the hair. Iris that are formed by bulbs produce thin, grass-like leaves and grow in tight clumps. The many varieties available to the gardener differ dramatically; most growing in drier soils, and some able to grow in standing water. 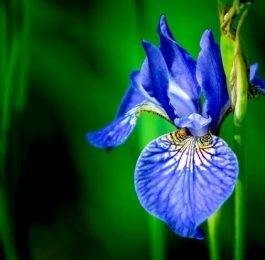 There are varieties that bloom in very early spring, such as Iris reticulata, with its bright violet-blue petals, and others that bloom right through the summer. Some need the full sun while others will tolerate part-shade. With all of their distinct features, various groupings placed throughout a flowerbed will provide colour for a great length of time. The most commonly seen iris for standing in water, is the Yellow Flag. With its long green-grey, thin leaves arching gracefully, the bright yellow blossoms rising above really standing out. The 4-8 blossoms on each stem can reach up to four feet if given ample compost and ideal conditions, however most grow three feet tall. This plant can also be grown well in drier soil or in large containers, just remember to water it well each day. Another type of iris regularly grown is called the Siberian Iris. The two most frequently seen varieties available to plant are called “Snow Queen”, which is creamy white with a yellow beard, and “Perry’s Blue” that is a very dark, royal blue with a bright yellow beard. They usually flower in June and July, and once finished their blooming, their arching and graceful leaves give a nice sound when blown in a light breeze. They commonly grow three feet tall and spread slightly with each season. 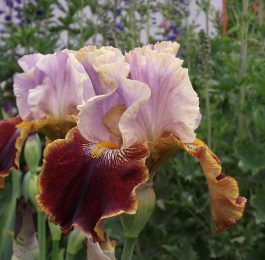 The last variety with the most characteristics are the rhizomatous iris. These iris have three categories they fall in; bearded, beardless and crested. The crested variety is different by sporting ridges in place of the beards. All of these iris have sword-like leaves that fan out that can be plain green or variegated. 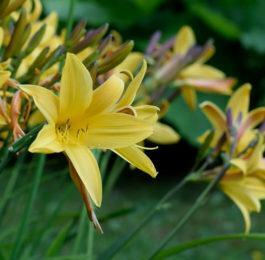 Most bloom in late May and June, but there are varieties that will bloom in July. These iris range in height from 6 inches to 4 feet, with their flowers spanning anywhere between 2 inches to 7 inches across. With all the colours available every gardener’s taste can be satisfied. Iris can be grown from seed, but it takes at least two years before it will produce a bloom. Purchasing a packaged or potted rhizome or bulb is the easiest method to acquire iris’, remembering to divide your clump every three to five years to keep them healthy and flowering. 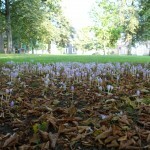 If iris are not divided, the clumps get congested, therefore blooming less and disease and insects can become a problem. One problem to watch for in the rhizomatous iris is the iris borer, which resembles a grub. To help control the infestation of iris borer, it is best to prevent them in the beginning by spraying in the early spring with Cygon 2E using the manufacturer’s instructions. Also, remember to clean up any dead foliage right away and discard of any infested tubers. Personally, I grow twenty-three different iris in all the various groups I have mentioned. I enjoy their flowers, as well as the texture they provide when not in bloom. 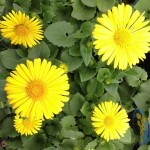 This texture provides a smooth transition from one plant to another and adds interest all year round. There are other varieties that I am interested in purchasing this year, now I just need to find a place for them, but like most gardeners I am sure to find the room for more.